This beautiful Tiger Eye pendant is encircled in a Sterling Silver bail to set everyth3ing off just right! 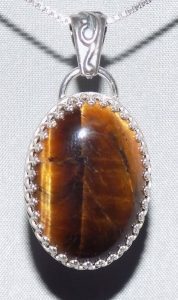 This elegant Tiger Eye pendant is set in Sterling Silver, and is approximately 1 1/2″ tall, including bail, and 3/4″ wide. The necklace includes an 18″ Sterling Silver Chain.